The fall school term is fully under way, and here at CSC, we’re thinking back with smiles on our faces, about the wonderful children we shared our summer with, that are now officially Kindergarteners! We’re smiling remembering all the fun we had, but also because we know that after a few weeks at Summer Kindergarten Enrichment Camp, these little bundles of energy are prepared and ready to take on the challenge of a new environment, new adults, new peers and new experiences. The Kindergarten setting requires young students to spend more time sitting, listening, and following direction. They need more refined motor skills to create letters and numbers. They need to be able to integrate sensory input and self-regulate and self-monitor in order to respond appropriately to changes in the physical environment of the classroom as well as the social landscape of the classroom and playground. Summer K-Camp gave our little pre-Kindergarteners the tools they need to meet all these challenges successfully. 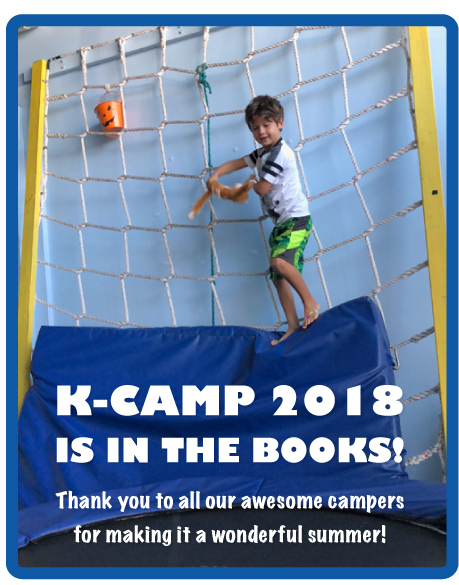 Hanging out in our large sensory gym, campers, using mindfulness as a platform, engaged in myriad positive social learning experiences, built phonological awareness, and began to build their desire for lifelong learning. Mindfulness practices during circle time and moments of stillness, taught campers to pause and recognize sensations, impulses and the need to think and plan. They learned about positive self-talk, and how to build a loving relationship with their inner selves, a critical first step to developing successful social relationships with others. Using the methodology of “whole-body” listening and the “Zones of Regulation”, campers fostered the self-awareness needed to be social and open, and to be able to ask for help and verbalize needs and experiences. Working these social-emotional “muscles” resulted in our campers gaining strength in social and educational learning, allowing it to happen organically and with meaning. Working those muscles also required “flexibility” in thinking during activity transitions, like from the fully active gym to table-top time, which required children to attend and be more on task. Our camp facilitators loved seeing the kiddos learn while they played with letters and sounds. Who doesn’t love to hear little voices boisterously “moooooo-ing” like cows to match the sound with the letter? Every year, it seems, the sensory activity the kids like the most is using their fingers to form letters and free form shapes on the “shaving cream table”. Messy, but fun! Like any summer camp experience, each child took away his/her own set of “nuggets” of fun and learning, but we know that all of them left with a tool box full of skills that will help them have the best start possible to their academic career. Learn more about Kindergarten Enrichment Camp at Child Success Center.